The Sunday Salon: 2010 Reading in Numbers & 2011 Goals – my books. my life. Ooh I love the idea of tracking shortest and longest book! Holy smokes, you are definitely the stats queen! So thorough. I was lucky to keep track of how many books I read. Your goals are admirable. I like how you tracked genres, long and short books, etc. I’ve had that same problem with library holds…I get carried away, and then have a whole stack to read. I love the crunching of the literary numbers too! So much fun. Looks like you had a great reading year! For me, I’m happier when I actually read library books instead of books I buy….It’s better for me to wait for library books to come in rather than going out to purchase the books right away! Here is my Sunday Salon post. Congrats in 2010, you did pretty great even if you didn’t meet all of your goals. Good goals for 2011 and all the best with them. Happy New year! Allende is among those authors which I have never read, but own numerous books by. (As is Atwood, btw, but I own more by Allende). I wish I could get myself to pick up one of her books, but it is as if I always forget about them? Great post, i’m always looking forward to the end of year stats. 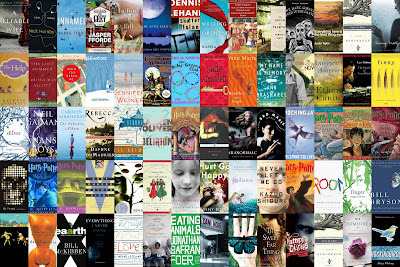 You’ve had an amazing reading year. I’m currently reading my first Allende, The house of Spirits, and it’s really good, so if 2011 is the year you get to it, you should know that’s a good one. Good luck with your 2011 goals! Great list! I’d love to get all those numbers for myself, but I’m terrible at keeping track of things. And updating Goodreads…that’d actually help a lot. Nice post!